Its crazy, considering I have 240 levels to be included in the initial release. I implemented the data structures and file reading before I came up with the editor, so I was stuck with various technical difficulties in trying to implement data output from the editor (and of which I am unwilling to spend the time on). So now i bear the punishment of having to manually input the data for the 240 levels when its done. Its tough balancing the difficulty of the game. What I learnt from developing TRG was that what seems easy for me to achieve in a game I designed, may very well be too difficult for average players. I kept that in mind when designing the levels for Singularity. 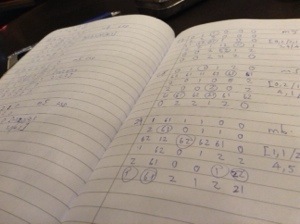 But an early playtest by my friends shows that the puzzles may still be too tough for casual players. 60 of my levels had already gone through a redesign prior the playtest, if i had to do it again, it will have to apply to nearly all of the 240 levels. World of pain awaiting. I will need another couple more playtest sessions with other people, perhaps getting TA forumers on my testflight. Meanwhile, I am still 90 levels away from finishing level designs. Fight on, boy.